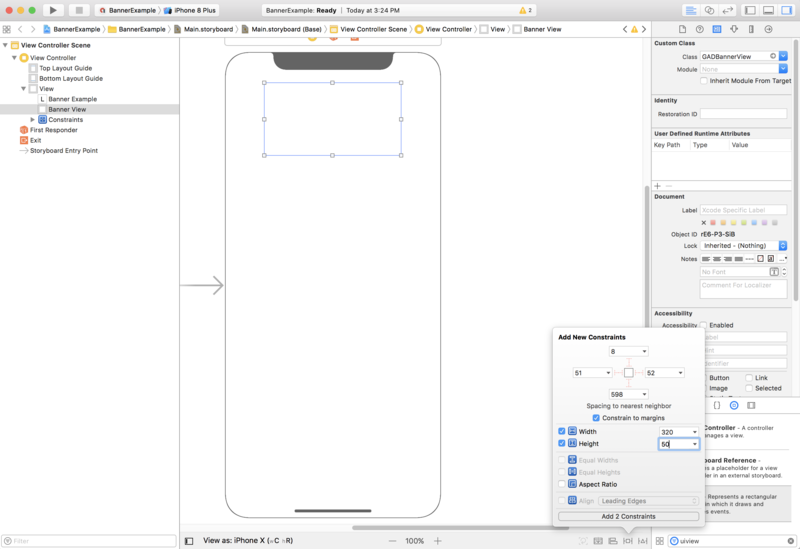 This guide demonstrates best practices on how to code your apps to render ads correctly on the iPhone X. Import the Google Mobile Ads SDK version 7.26.0 or higher, either by itself or as part of Firebase. Banner ads must be placed in the "Safe Area" to avoid being obscured by rounded corners, sensor housing, and the Home indicator. On this page you'll find examples of how to add constraints to position a banner to the top or bottom of the Safe Area. 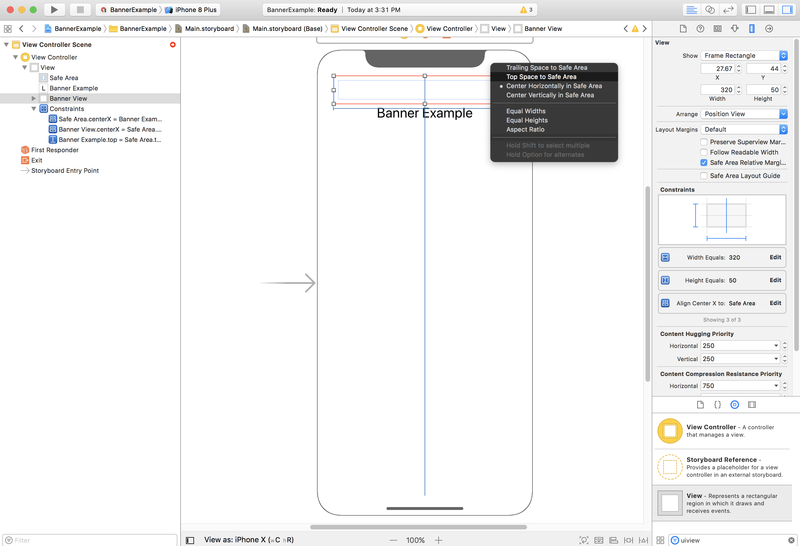 Both storyboard and programmatic constraints are demonstrated in an environment that supports iOS 9+ and Xcode 9+. Workarounds for earlier versions of iOS and Xcode are also noted. If your app uses Interface Builder, first, ensure you have enabled Safe Area layout guides. To do this you need to be running Xcode 9+ and targeting iOS 9+. Open your Interface Builder file and click on your view controller scene. You will see the Interface Builder Document options on the right. Check Use Safe Area Layout Guides and ensure you're building for iOS 9.0 and later as a minimum. We recommend you constrain the banner to the size required using width and height constraints. If you wish to have a left- or right-aligned banner, constrain the left/right edge of the banner to the left/right edge of the safe area and not the left/right edge of the superview. If you have Use Safe Area Layout Guides enabled, interface builder will default to using the safe area edges when adding constraints to the view. 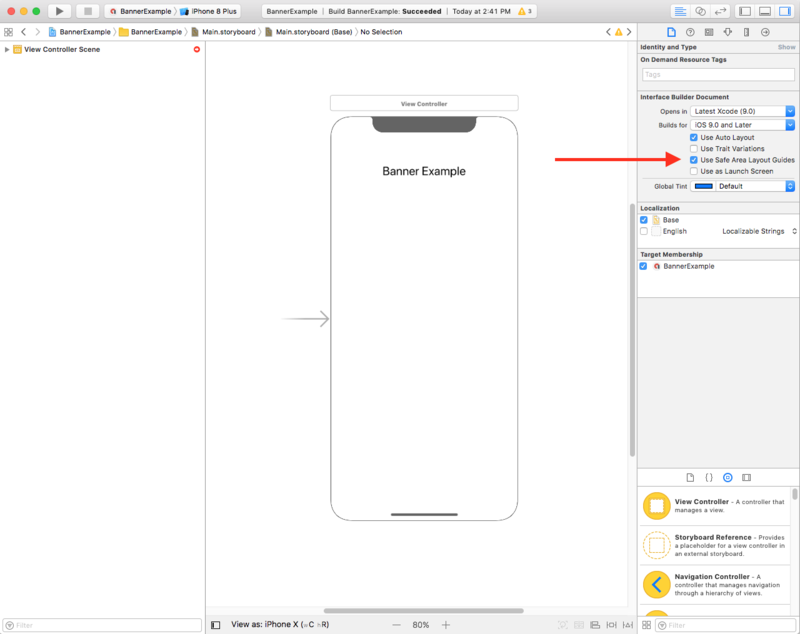 If you want to support iOS 8 or below using Interface Builder, you should uncheck Use Safe Area Layout Guides for your Interface Builder files and storyboards. This will offset the edge of the banner a little from the edge of the superview/Safe Area, assuring that your banner won't be obscured in landscape orientation on iPhone X. You can also achieve the desired result programmatically. 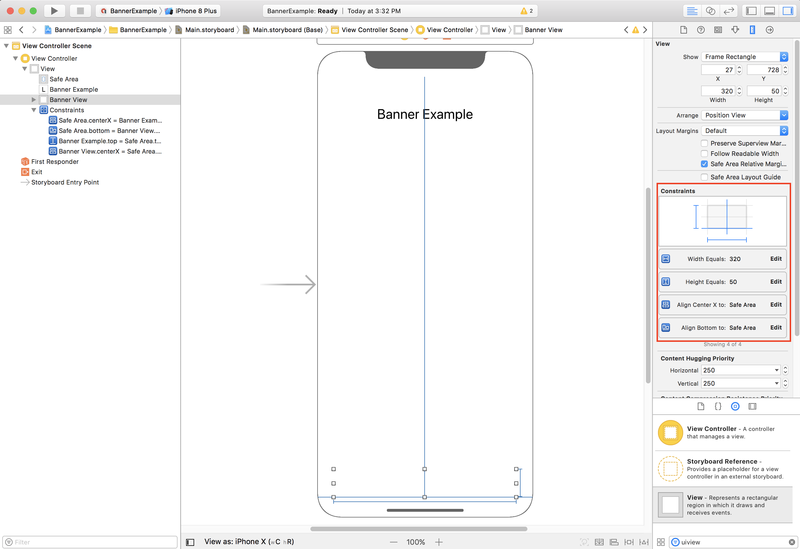 // Instantiate the banner view with your desired banner size. // Set the ad unit ID to your own ad unit ID here. // Center the banner horizontally. // Lock the banner to the top of the bottom layout guide. The techniques above can easily be used for constraining to the top of the safe area by modifying the attributes and anchors used. If you're using smart banners, particularly in landscape, we recommend that you use constraints to align the banner edges to the left and right edges of the safe area. In interface builder, this is supported back to iOS 9 by checking the Use Safe Area Layout Guides option as outlined above. If your app pins native ads to the top or bottom of the screen, the same principles apply for native ads as they do for banner ads. 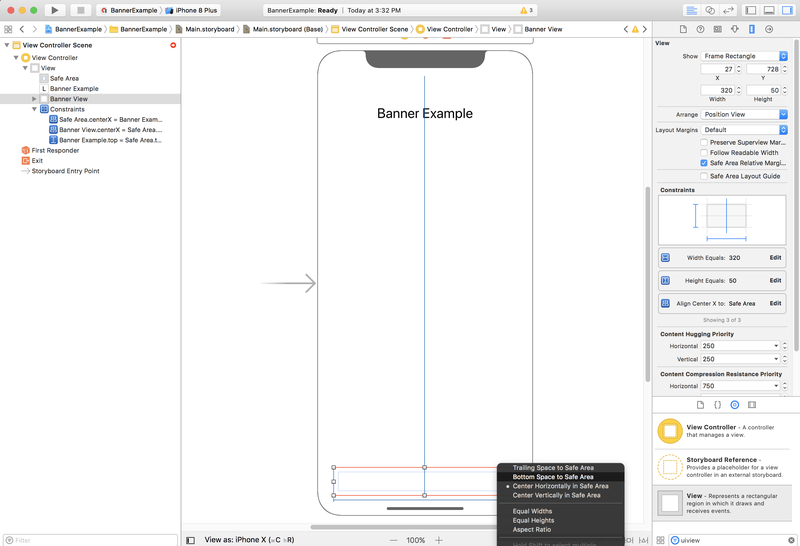 The key difference is instead of adding constraints to a GADBannerView, you'll need to add constraints to your GADNativeAppInstallAdView and GADNativeContentAdView (or the containing view for the ad) in order to respect the Safe Area layout guides. For native views we recommend providing more explicit size constraints. As of Version 7.26.0, the Google Mobile Ads SDK fully supports interstitial and rewarded ad formats for iPhone X.